A few days ago, I got an e-mail from the team behind DragDropr, a new drag and drop (what’s in a name, right?) 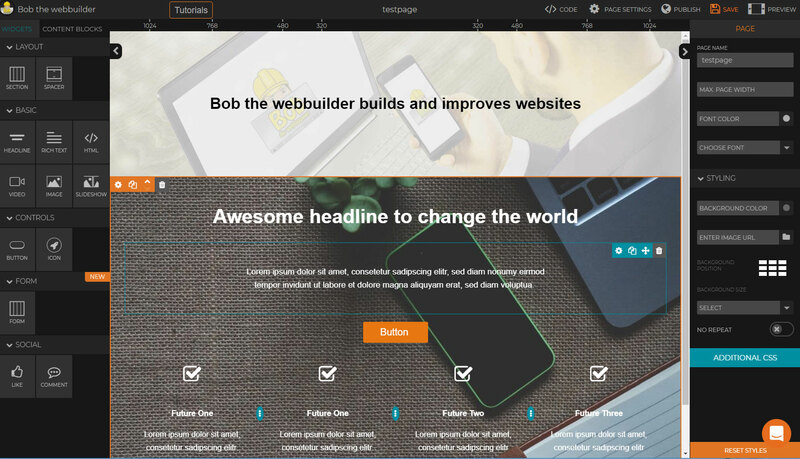 page builder that works with all CMS platforms. What’s most innovating though is that you can take your design with you if you ever want to switch to another CMS. So, for exampe, if you build a webshop in Magento and you want to switch to WooCommerce, you can do that and take your DragDropr design with you. Cool, right? They read my Divi review and asked me if I would like to do a review on DragDropr as well. Ok, but be carefull what you wish for 🙂 Here we go! The DragDropr interface looks quite intuitive. As you can see in the picture above, it has the widgets and content blocks on the left, your web design in the middle and the settings on the right. Their motto is “what you see is what you REALLY get” and they sure live up to that promise: you make your changes live on the front end of your website so you can see the effect of any change you make in real time, just like your visitors will see it. You might think the color palette is a little boring, but it makes sure the focus stays on the web design itself – where it should be. The colors might be a little too subtle though, making it hard to read for some. On the left, we can choose from about 10 widgets (other page builders would call these modules). Other page builders offer a lot more than 10 modules; Divi offers about 40 modules (and more to come) and the pro version of Elementor even offers up to 60 modules. Not all of those modules are really useful, but counters, progress bars, pricing tables, testimonials, accordeon / toggle views are – and you won’t find them in the current version of DragDropr. The widgets that are included are headline, rich text, HTML, video, image, slideshow, button, icon, form, like and comment. You can just drag and drop a widget to the desired position on the page, that works fine. There will be some placeholder content so you can see how it looks right away. Every element will take up one entire row at first, but you can drag another widget to the left or right side of the row to add another column. You can build your entire page from scratch using the widgets, but you can also start with a content block. A content block is a pre-designed section with some widgets in it, which can really speed up your design process. You see such a content block in my screen shot above. Even though DragDropr doesn’t offer dedicated widgets for things like testimonials or pricing tables, they do have pre-designed content blocks for that. After all, a testimonial is nothing more than an image, a few text blocks for the name and the review text and some additional styling. DragDropr comes with about 200 of those content blocks, which have a nice and professional designed look. You can also save your own designed sections as a content block. Good responsive design is a must for every website nowadays, and DragDropr has some settings to help you with this. At the top of the interface screen, you see a few numbers: 1024, 768, 480 and 320. Those are breaking points. If you select the 1024 mode, you’ll see how the site looks on a tablet in landscape, if you select the 320 point you’ll see how it looks on a small mobile phone in portrait and so on. That works quite nice. You can choose to show or hide any widget on the selected screen size, but you can’t change the styling per device. For example, in Divi I can set a headline to be 24px on desktop and 16px on mobile. That’s not possible with DragDropr. A thing I really like about DragDropr is the build-in chat. You can just type your question without ever leaving the builder interface and a support operator will answer them within a few minutes (in my case). The chat window will show you if your question is seen yet and how long you’ve been waiting for an answer. The support agents do need some training though… at first, I couldn’t figure out how to divide the row into multiple columns. So I asked support… only to hear they didn’t know the answer either and had to forward my question to their technical team. Really guys? That’s a really basic question that you should be able to answer right away. I got an answer 30 minutes later, accompanied with a screenshot with some arrows drawn on to it to clearify. So they get an A for effort, but they failed the test itself though. There are also no docs or tutorial videos available yet, with the exception of a 2 minute tour of the builder on first use. Pricing starts at $ 99 a year, but if you want all features you’ll have to pay at least $ 19 per month. With the cheapest plan, you won’t get the button, form and social widgets. Do you like the DragDropr interface / look & feel, but do you want more features and spend less money? Then Oxygen just might be the tool you’re looking for! In my opinion, it’s too early to start using DragDropr. They have build a nice foundation, but page builders like Divi or Elementor are more user-friendly, offer way more features and styling options and have a lot of documentation available. On top of that, they are a lot cheaper than DragDropr as well. Of course, those two are WordPress only, while DragDropr can be used in any CMS. I have no idea what other page builders are available for Magento, Shopify, TYPO3 or LightSpeed, so DragDropr might be a great choice for those platforms. For WordPress, I would choose another page builder at this time though. The option to take your design with you if you switch platforms is a great feature, but how many times have you switched to another platform already? I did that only once, from a static HTML site to WordPress, but I updated the design in the process as well. This article is written by Bob the webbuilder, an allround website expert who blogs regularly about all kinds of subject to help you build your website. Do you need help? Hire Bob to build your website or improve your existing website. E-mail me when there's a new comment on this article.